The Football Front’s Matt Bruce takes a look at Sussex, and the recent growth and development of the Sussex’s clubs. 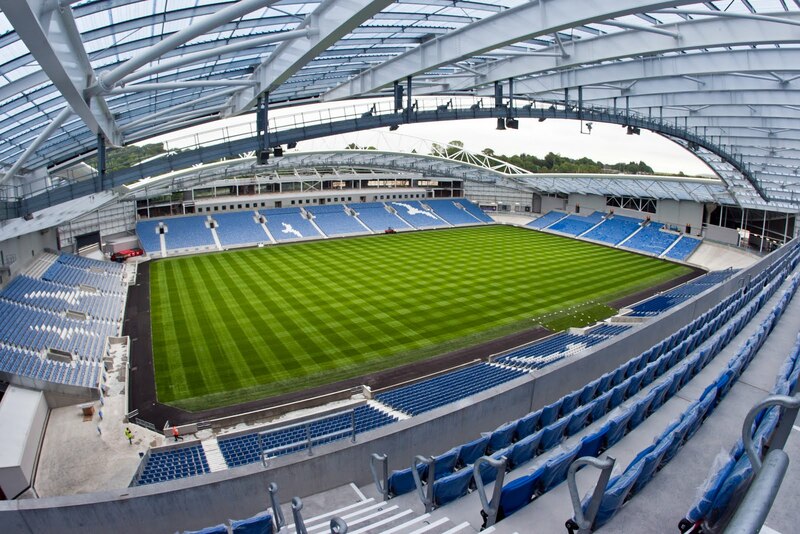 It's a good time for professional football in Sussex right now, Brighton appear to be going from strength to strength at their new Amex Stadium. While Crawley begin their first season in the Football League and are even favourites for promotion. Both clubs have been through significant and well-publicised difficulties over the years, but the Sussex clubs now appear to be on the up and there is little doubt that all eyes are focused on Sussex this season. It's been a long journey for Brighton. They were evicted from the Goldstone Ground in 1997. Since then, supporters have had to endure a period of exile in Gillingham and the utterly soul-destroying experience of watching their football from the wrong side of a running track at the Withdean. After enduring 14 years of struggle, it's as if the club is now awakening from a long sleep, with promotion back to the Championship coinciding with the move to the new, £105 million stadium. Brighton's average attendance at the Withdean was below 6000. But for their first season in their shiny new home, the stadium will be full to its 20,000+ capacity every week, with season ticket sales going through the roof. The man responsible for this south coast renaissance is professional gambler, Tony Bloom. He is the third generation of his family to be involved in the club (both his uncle and grandfather have previously been on the board at Brighton) and the sheer scale of his investment – 'injecting' £80million when he took over – suggests he is less a businessman investor, more a supporter and benefactor. 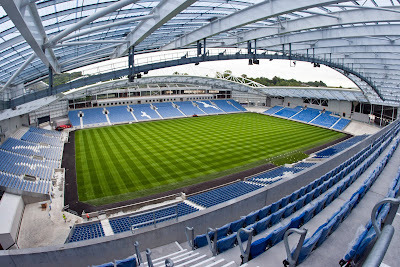 In funding the construction of the Amex he has not simply built another identikit modern stadium, but has created the much-needed new home for the club and its supporters, which for so long the club has lacked. But it is not simply off the field where Brighton have made great strides. Manager Gus Poyet guided the Seagulls to the League One title at a canter last season, sealing promotion to the championship in mid-April. They begin their first campaign in the Championship as quite highly fancied to follow in the footsteps of Norwich in winning a second consecutive promotion to reach the Premier League. This summer Poyet has added to his title-winning squad by spending some serious money. The club smashed Brighton's previous record transfer fee by paying out £2.5million for Peterborough striker Craig Mackail-Smith and spending a total amount of £4million on transfer fees alone over the summer. For a club who have traditionally been cash-strapped, this is megabucks. Inevitably, all eyes were on Brighton last weekend. They opened their new stadium on the opening day of the season against Doncaster Rovers –ironically, they were also Albion's final opponents at the Goldstone Ground in 1997. Brighton certainly didn't disappoint. The players arrived on the pitch to a sea of white and blue flags waving from three sides of the ground, but Doncaster came to spoil the party and took advantage of Brighton's nervousness by taking the lead in the 39th minute. Brighton appeared edgy for much of the match and were uncharacteristically uncomfortable in possession, but they did enough to win the game. However, they left it late. The equalising goal came in the 83rd minute as debutant Will Buckley's beautiful strike found its way through the bodies in the area and into the bottom corner. While the winning goal came deep into injury time and it was Buckley again who, with practically the last kick of the game, broke free and slotted past the Doncaster goalkeeper. Now the club have their first win in their new stadium, everything is surely in place for the club to step up to the next level. With the scale of investment in the club, along with the level of support that has emerged locally, it may not be long before Brighton are playing top-flight football for the first time since 1983. Moving northwards, Crawley Town are another Sussex club that is making waves at the moment. Like Brighton, they've been through their fair share of trouble off the field and have become quite familiar with winding up orders and points deductions. Even as recently as February 2010 the club found themselves in court to fend off a winding up petition from HMRC. However, following the takeover of the club by millionaire and lifelong fan, Bruce Winfield - backed by some extremely wealthy mystery financiers - the club paid off its sizeable debts over the summer of 2010 and began a spending spree never seen before in non-league football. Crawley signed Matt Tubbs (£70,000), Sergio Torres (£100,000), Richard Brodie (£150,000) and a host of others as manager Steve Evans set about creating a league-winning side for 'Project Promotion'. Crawley's big-spending ways led them to be dubbed 'the Manchester City of non-league' by their detractors, but their incredible FA Cup run, which culminated in a trip to Old Trafford to play the other Manchester side, more than paid for the previous summer's spending. Crawley's expensively-assembled squad delivered in style as they coasted to the Conference title a week before their Sussex neighbours were confirmed as League One champions. Crawley money still hasn't dried up. In fact, they have added more quality to their side, bringing in Wes Thomas, Tyrone Barnett and John Akinde. It comes as no surprise that Crawley start the season as favourites once again for the title. Of course, a late Port Vale equaliser denied them an opening day victory. But a point away at Vale is a very solid start to the season and something positive to build on. Similar to the Brighton scenario, Winfield's interest in the club was not concerned with monetary gain, he just wanted to see his local club play in the Football League. Tragically, Bruce Winfield did not live to see Crawley kick off for the first time in the Football League last weekend. 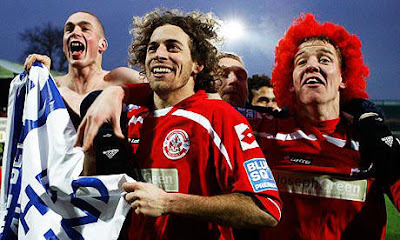 Just weeks before Crawley sealed their promotion Winfield succumbed to cancer. Without him, Crawley would not have made it into the Football League and their incredible rise from the depths is his legacy to his hometown club. The legacy left by Winfield is far more than just a team that has had a year of success. Crawley's success has led to a major rise in attendances, with last season's average being more than double that of the previous year and season ticket sales have more than quadrupled for this season. As well as a solid local backing, the club is improving facilities and infrastructure enables Crawley to sustain their Football League status in the long long-term. The club are even creating a new seating stand bringing the seated capacity up to the 2000 seats. This is something which is required for League One. In little over a year Crawley Town have been transformed from a poorly-supported non-league team, who were constantly beset by financial problems to favourites for promotion to League One – a position which, if achieved, would have been unthinkable to Crawley supporters not so long ago. Despite lacking the fairytale magic of Brighton's rise to prominence, Crawley's ascent is no less remarkable and with the financial backing they have, along with the incredible momentum from their Conference-winning season, Crawley look a very good bet to win another promotion in their debut Football League season. A special mention should also go to Lewes FC of the Conference South, who are yet another Sussex club with a chequered past. Having spent years struggling just to stay in existence, they have made the unique decision to opt for community ownership. Under this model, the club is wholly owned by its members and with annual membership costing just £30, club ownership is essentially open to all. Those responsible for instituting this unique community share scheme should be applauded for literally giving the club back to the local people of Lewes. In the year that has followed since the scheme was announced, the club has made significant moves towards engaging with the community, through various events and offers. Many non-league clubs are facing a real struggle in these uncertain times to bring in the fans and stay solvent, a move to community ownership, has raised more than £100,000 at Lewes and increased attendances. It could possibly be the way forward. Whether reaching for the heights of the Premier League, or beginning their new life as a Football League club, or even creating a new, community-focused blueprint for running a non-league club. Football in Sussex is healthier than it has been for a very long time. The county's football clubs have suffered an unusual amount of hardship. But now Sussex clubs at all levels of the ladder are leading the way as some of the most progressive and forward-thinking Football clubs in English football at the moment. Fancy the content I have seen so far and I am your regular reader of your blog. I am very much interested in adding http://thefootballfront.blogspot.com/ in my blog http://southafrica-2010-fifa-worldcup.blogspot.com/. I am pleased to see my blog in your blog list. I would like to know whether you are interested in adding my blog in your blog list. Hope to see a positive reply. Thanks for visiting my blog as well ! Waiting for your reply friend !!!! !